"Find the shortest. simplest way between the earth, the hands and the mouth." 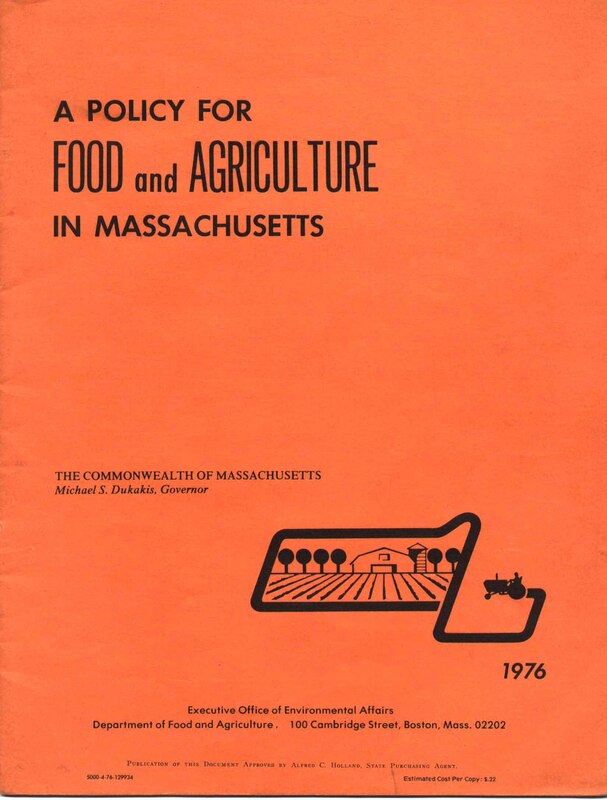 Susan Redlich was the director of the Massachusetts Department of Food & Agriculture's Division of Land Use in 1978. She visited Thompson Island to take a look at the conservation project we worked on with the students. As she was leaving the island she came up to me out of the blue and asked if I would be interested in organizing farmers' markets in Boston. I said "What's a farmers' market?" She explained. I said, "Yes!" 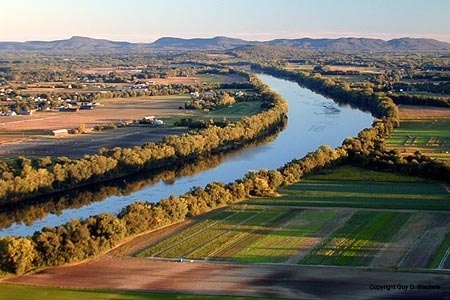 The Policy identified a number of options the state could undertake to preserve its farming resources and businesses without permission or resources from the federal government. Among these were measures for purchasing the development rights of farmland, taxing farmland based on its agricultural rather than potential development value and strong support for direct marketing activities. 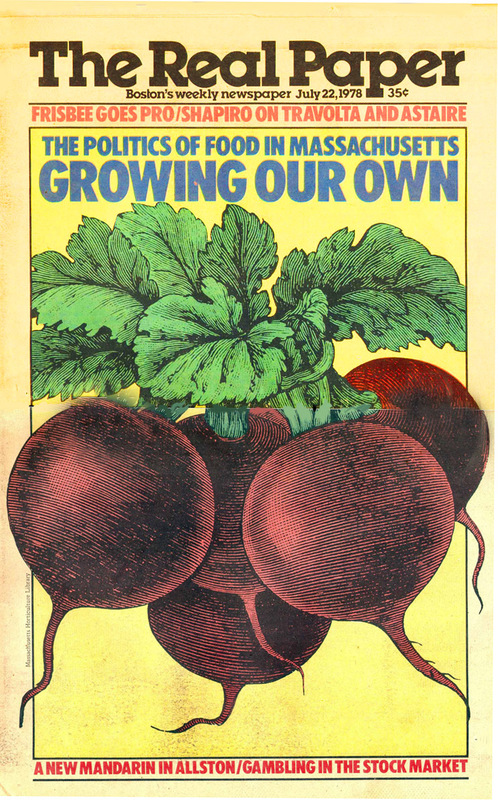 The urban gardening movement was gaining traction at the same as the state was promoting the need for strengthening the local agricultural infrastructure. 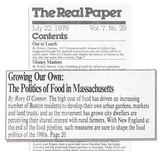 The Real Paper - an alternative weekly out of Boston - spoke of an emerging urban/rural alliance around food issues. 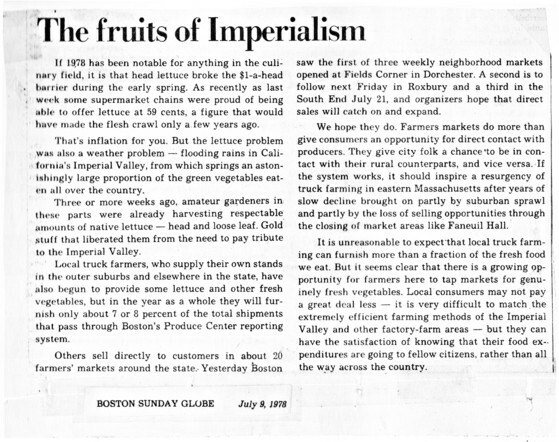 The above op ed by Mel King ran in the Boston Globe on the same day the Dorchester Farmers' Market had its grand opening. 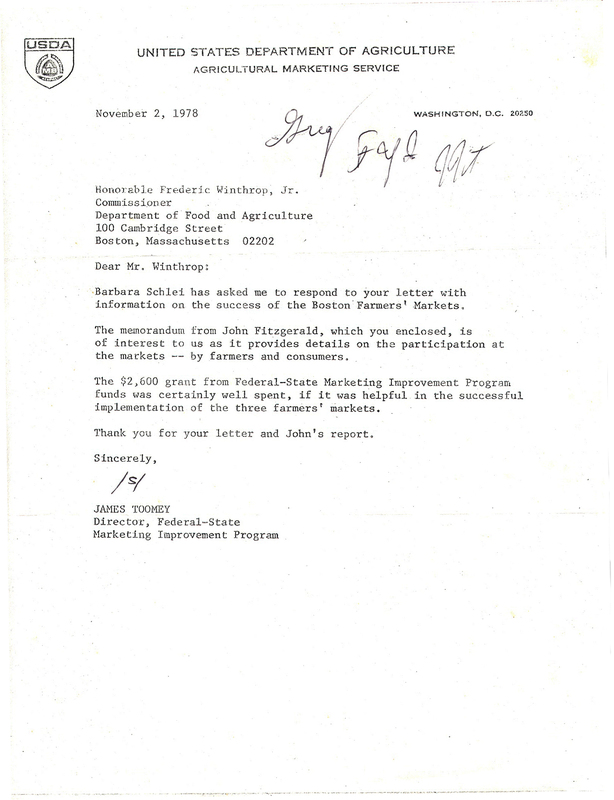 A proposal in 1979 to establish a farmers' market in Brookline, MA generated passionate opposition from the local Chamber of Commerce and some of its members. They feared a market at the site proposed would hurt local grocers and create a health hazard. 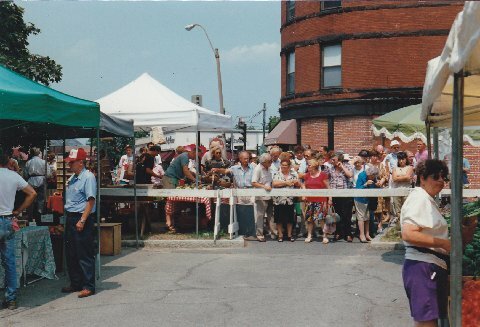 To allay fears, we told the town that if there was any evidence that the farmers' market was harming a local business or create a hazard of any kind, we would immediately shut it down. Town meeting voted in favor of opening the market against continued objections by the President of the Chamber of Commerce. After the first couple of weeks in operation, the Tab -- the weekly Brookline paper ran a story called "Welcome Farmers' Market" (cover illustration above, merchant ads below). 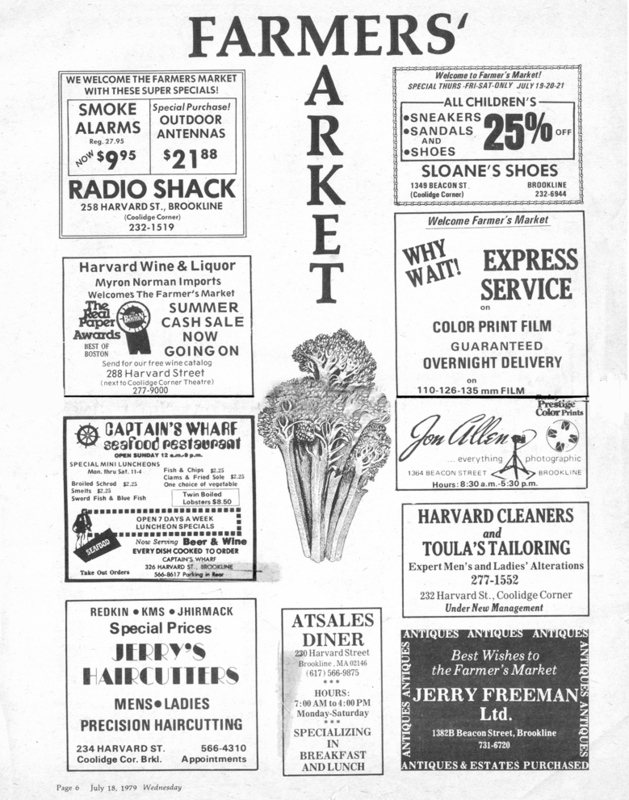 The Brookline Market was always extremely well designed, organized and run. 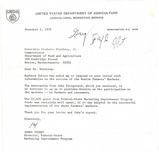 We received a $2,600 grant from the U.S. Department of Agriculture. It may not seem like much today, but it really was a morale boost for us back then! 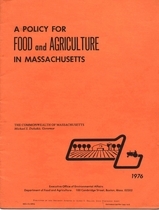 In the mid-1980s Massachusetts Commissioner of Food and Agriculture Frederick Winthrop issued "A Poilicy for Food and Agriculture for Massachusetts". 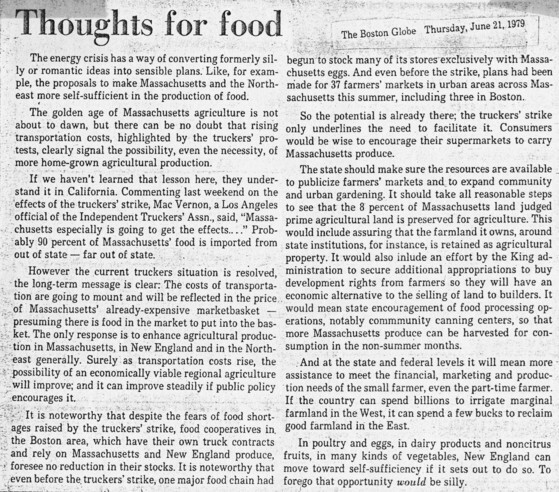 The policy was written in light of what author and writer-in-residence at Smith College Mark Kramer called "A Crisis In Yankee Agriculture" (he co-directed a film by that name). 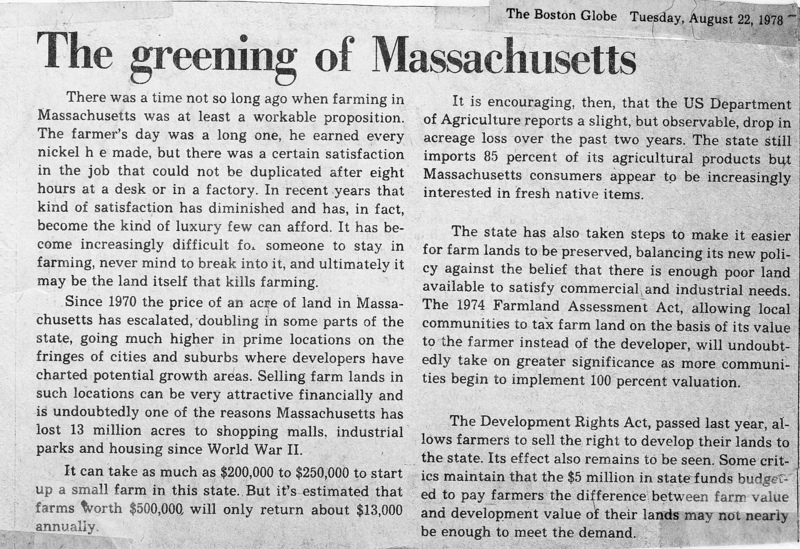 Indeed, the Commonwealth's farming industry had been in serious decline since the end of the second world war. 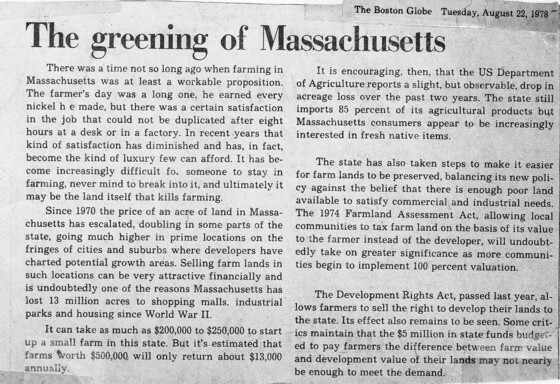 During that period Massachusetts was losing, on average, 20,000 acres and hundreds of farm businesses a year. 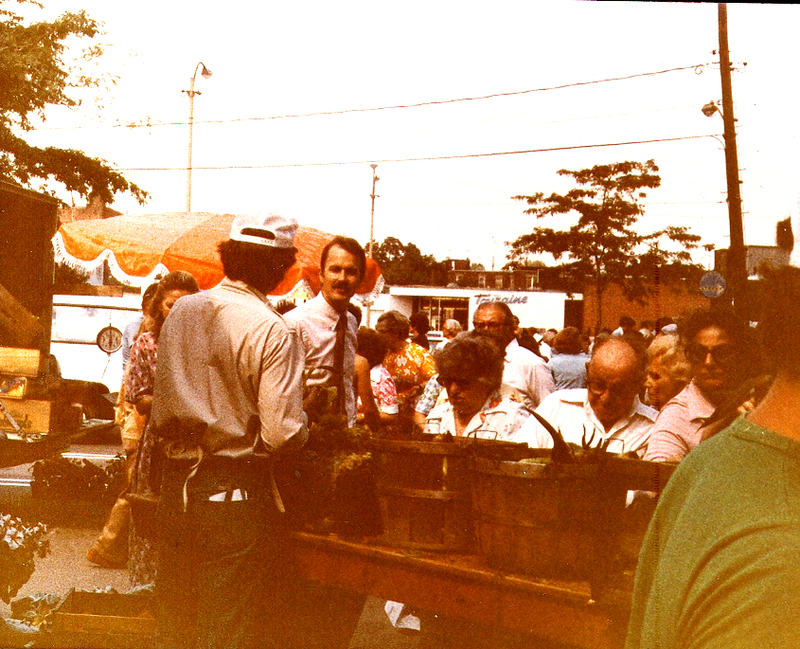 The Department's direct marketing initiatives included support for roadside stands, pick-your-own (PYO) operations and farmers' markets. What they all had in common was providing farmers with options to sell their produce wholesale, i.e. directly to consumers by eliminating the network of middlemen that make up retail markets. Roadside stands and PYO operations require customers to drive to individual farms to make their purchases. 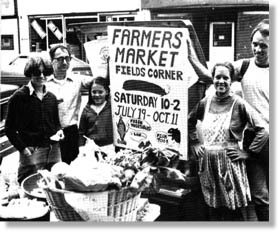 With farmers' markets growers bring their produce to consumers - ideally in densely populated neighborhoods in urban communities. 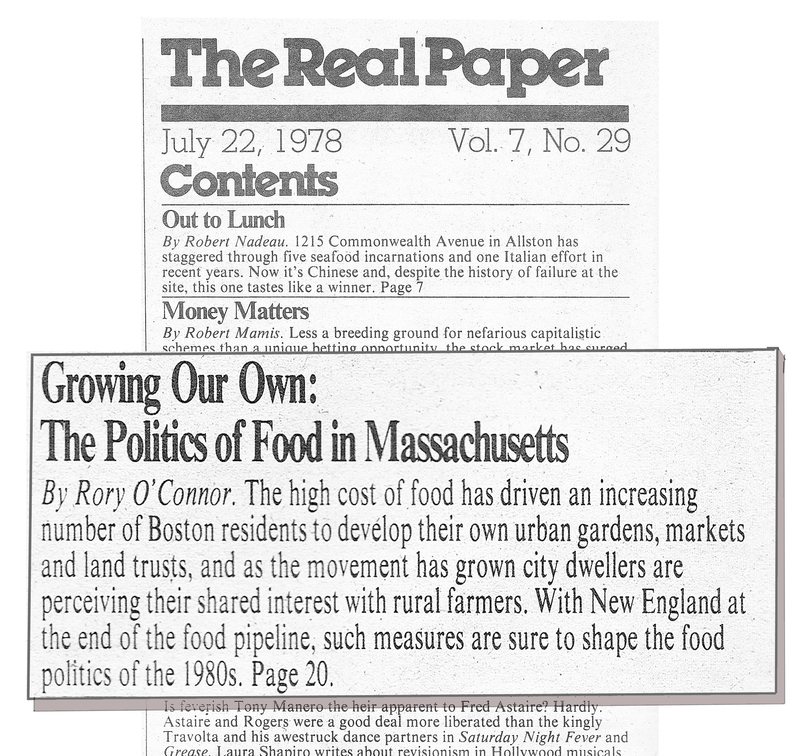 In 1978 Susan Redlich, director of the Massachusetts Division of Agricultural Land Use hired me as a consultant charged with organizing urban farmers' markets in Boston. 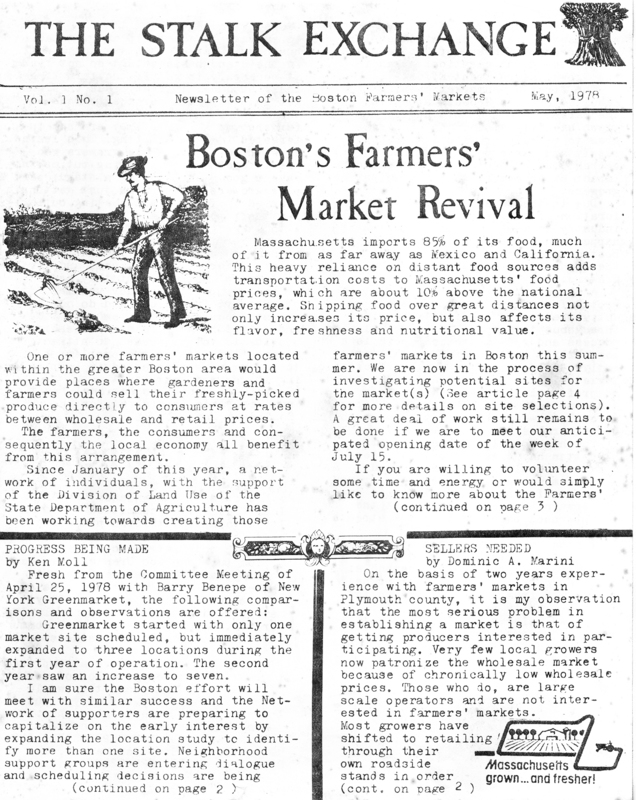 At that time there were no urban farmers' markets in the Greater Boston Metropolitan Area. In fact, there were less than a handful to be counted in the entire state. 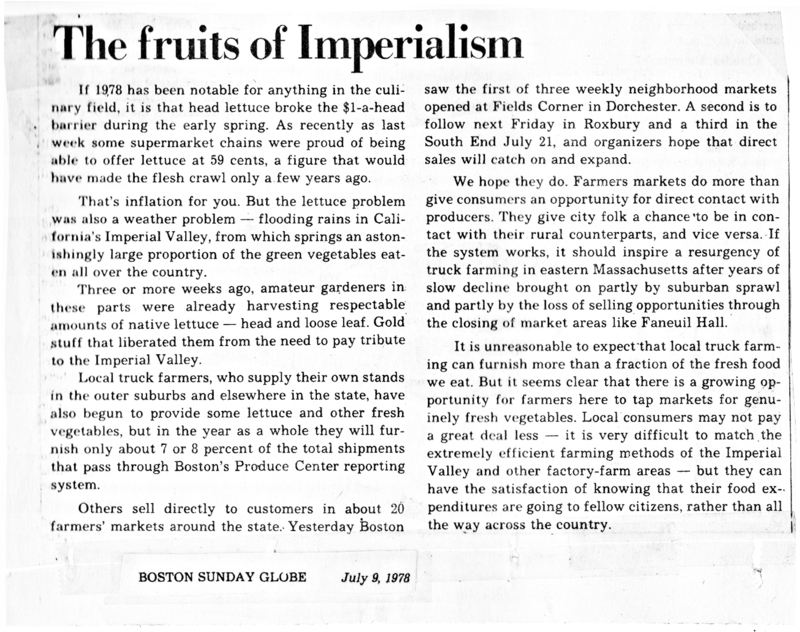 I did not know it at the time but came to understand that thoughtfully designed farmers' markets can serve as powerful trimtabs in support of local agricultural systems. There was no budget. However I had the great fortune of being approached by a high school senior named Michael Grunebaum from Buckingham Brown & Nichols who was looking for a summer internship. 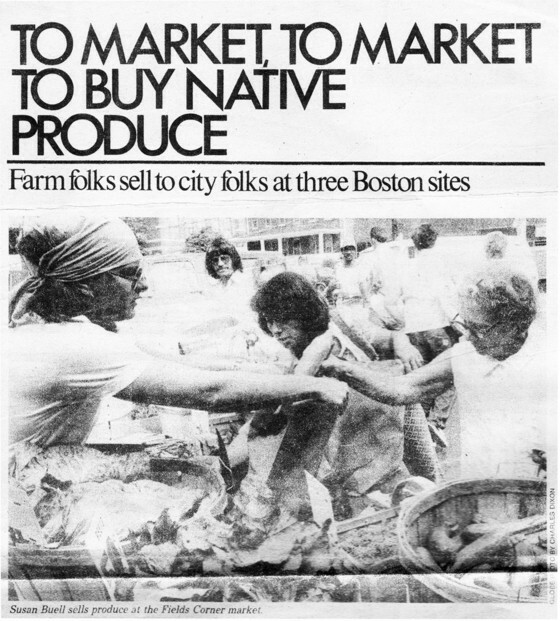 He worked with me to establish a network of markets in several Boston neighborhoods. 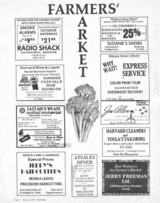 We developed a farmers' market newsletter ("The Stalk Exchange") flyers (see below) and met with community groups in a number of neighborhoods. 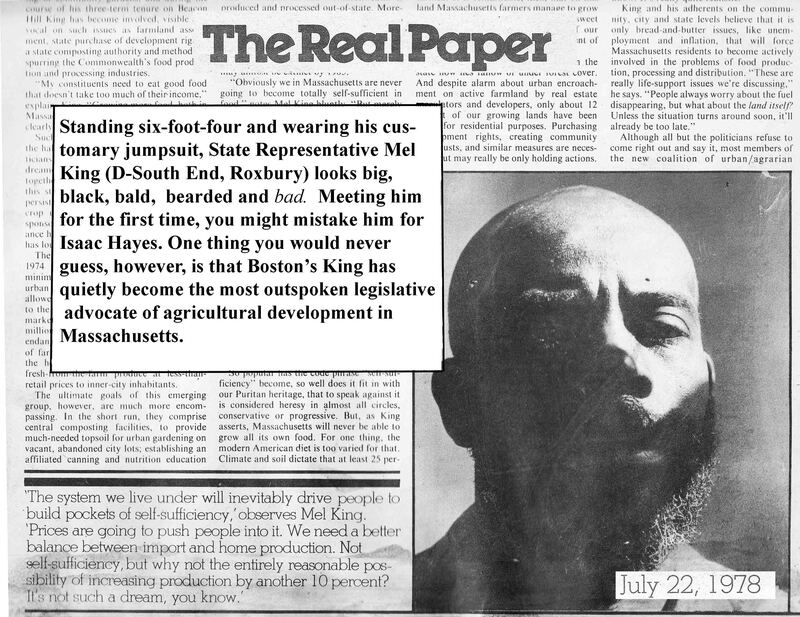 It was my job to recruit farmers to come into the city-- a very tough sell at the time. We were operating in the pre-personal computer days. 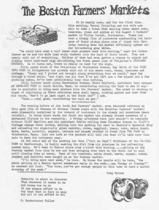 Michael and I had to produce our materials the old-fashioned way: type out the text; photocopy graphics from books and magazines; "Letraset" the headlines and then lay the whole thing out by physically cutting-and-pasting the final product. 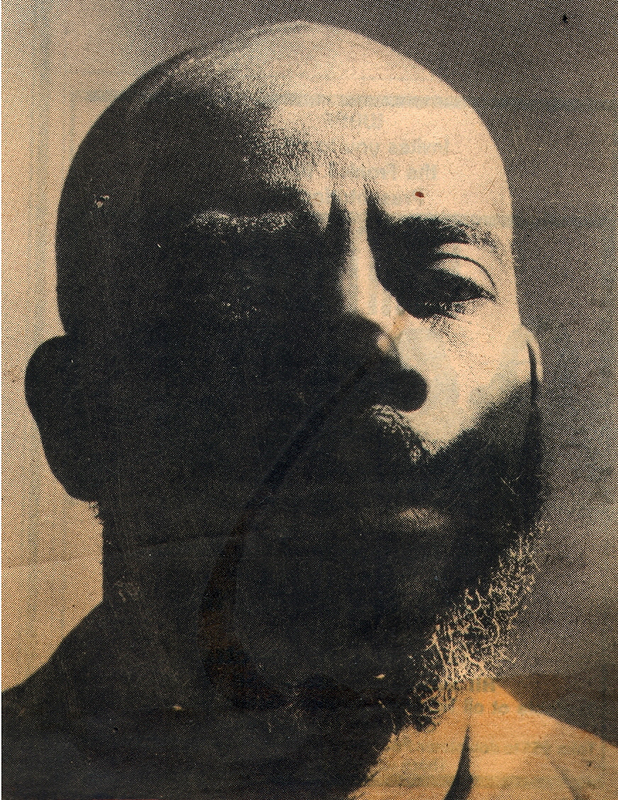 When we took the version shown above to the state's central printing office, it was rejected. 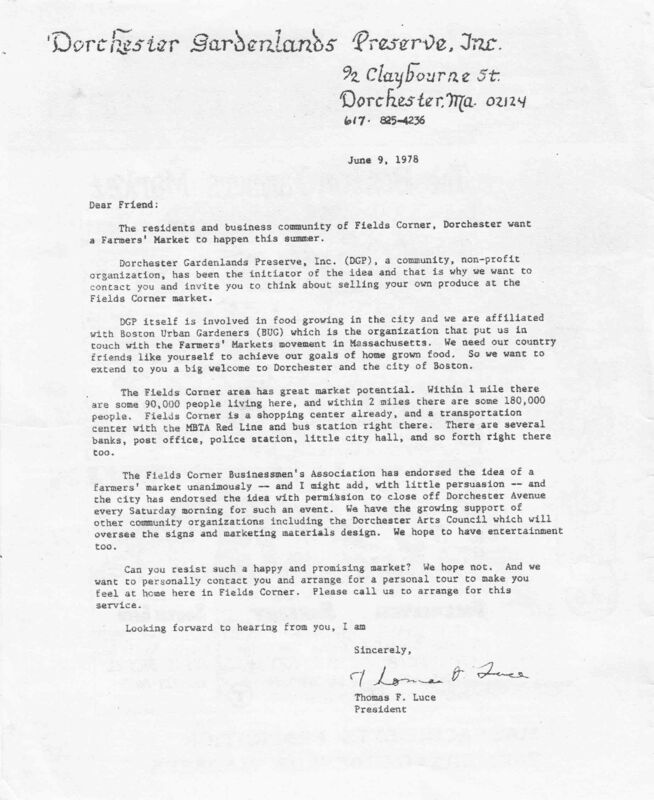 We were told that they were not allowed to print newsletters -- state policy. Michael and I went back upstairs to my cubicle and thought about what the person in central printing said to us. So we "whited-out" the word "Newsletter" and replaced it with the word "Report". We took our revised document back to central printing. Our copies were made. No questions asked. 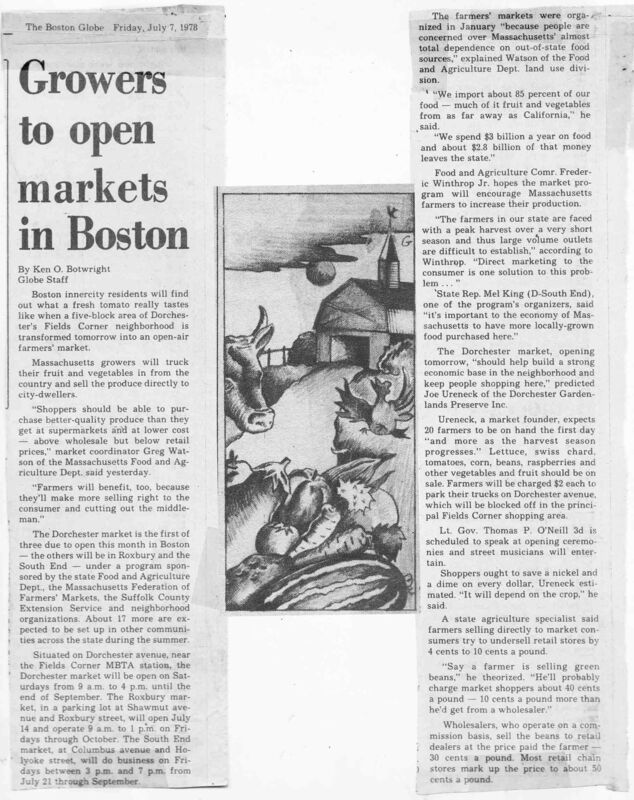 As many as 14-20 farmers said they would participate in the grand opening of the Boston Farmers' Market season on July 8, 1978. When the market opened on a closed-off section of Dorchester Avenue at 9 AM there was not a single farmer in sight. Around 9:15 Katchie Berberien and his wife and daughter from Northboro, pulled onto "DOT Ave" and sold out their produce before they could unload it from their truck. In the process they probably saved the entire initiative. That evening their fellow farmers saw them selling their stuff like mad on the local news. 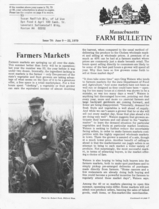 The next week, the market got its 15 farmers and has been operating ever since. 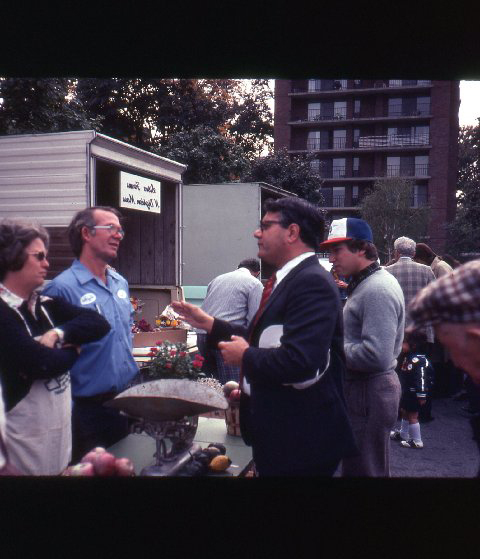 Below (left) Katchie in 1978 at the Dorchester farmers' market and in 2010 selling at the Brookline farmers' market (Gus Schumacher photo). 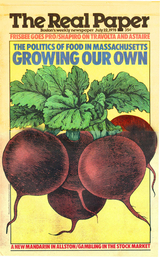 Serve as a "springboard" for innovative projects/programs promoting locally grown produce. 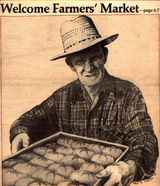 Harry Currier drove the 90 miles from Orange, MA to sell his produce at the Dorchester and South End farmers' markets. 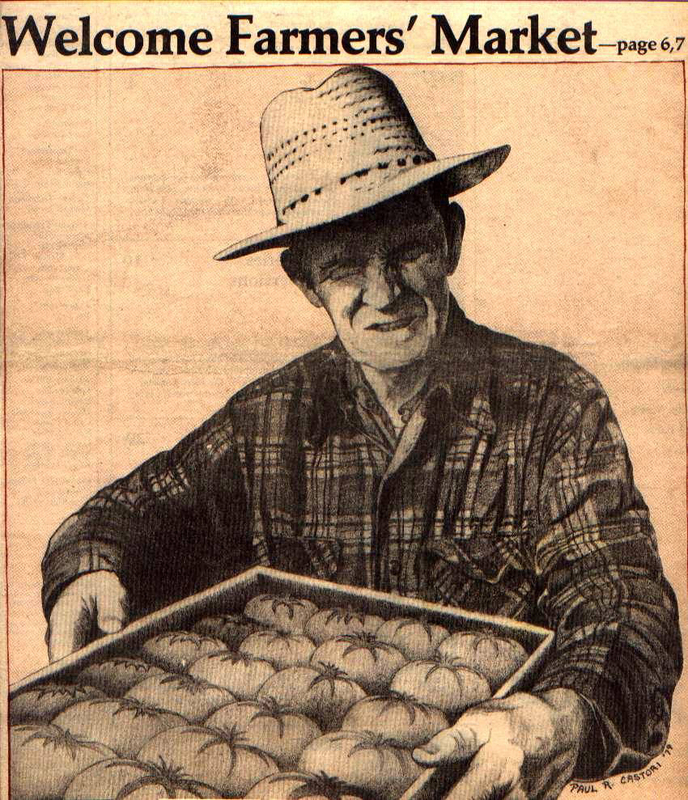 He brought mostly potatoes, cukes and zukes. We asked him if it really was worth it to drive that distance. He said it was. He also told us that his wife asked him to buy a new hat for the days he sold in Boston. He did. It was quite dapper. Harry was an innovator. 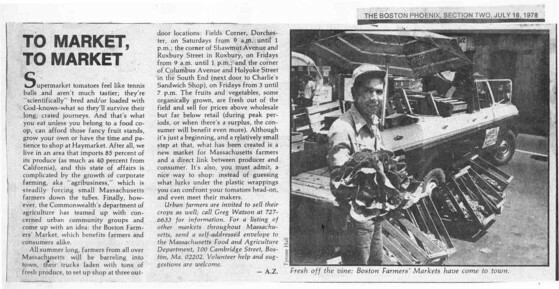 When he learned of the tremendous demand for fresh collards in the South End, he decided to grow some for the following years' market. They were not only a hit but a real demonstration of information exchanged directly between grower and consumer can be mutually beneficial to both. In the traditional and entrenched wholesale system, the "middlemen" are the major beneficiaries. Grand opening of the Dorchester Farmers' Market (1978). That's Lt. 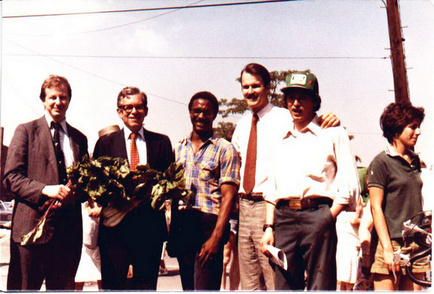 Governor Tom O'Neill with a head of cabbage. The guy in the plaid pants did not want to be identified. 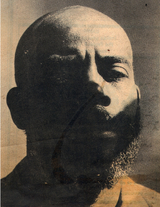 The press was supportive from the very beginning and we nurtured that relationship every chance we got. 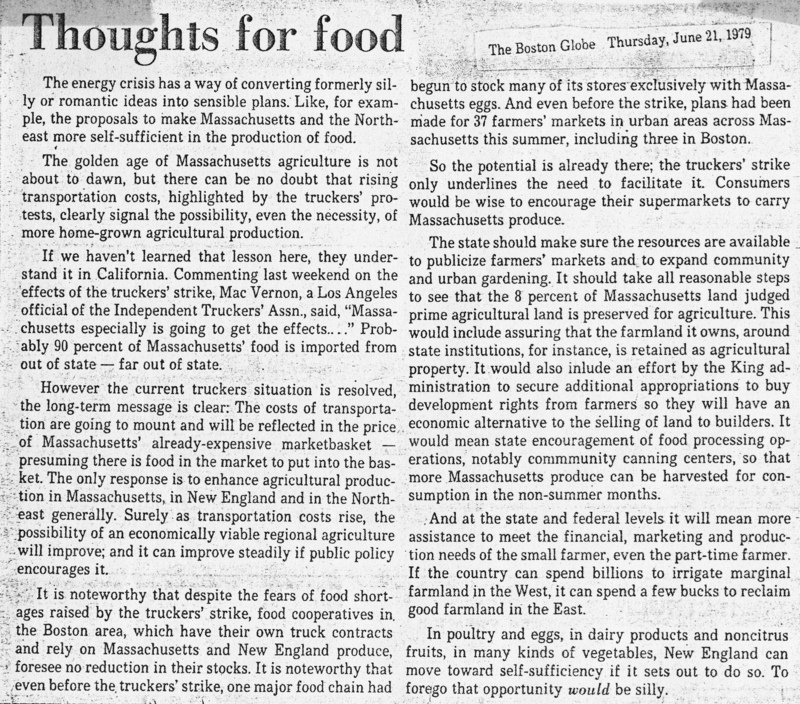 The above Boston Globe editorial ran the day after the Dorchester opening. 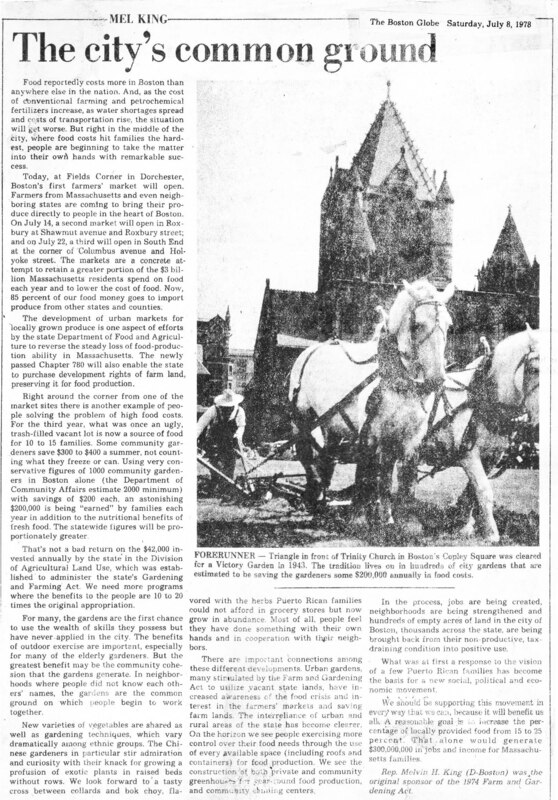 The Globe and along with other print and electronic media were still covering us a month later (see below). 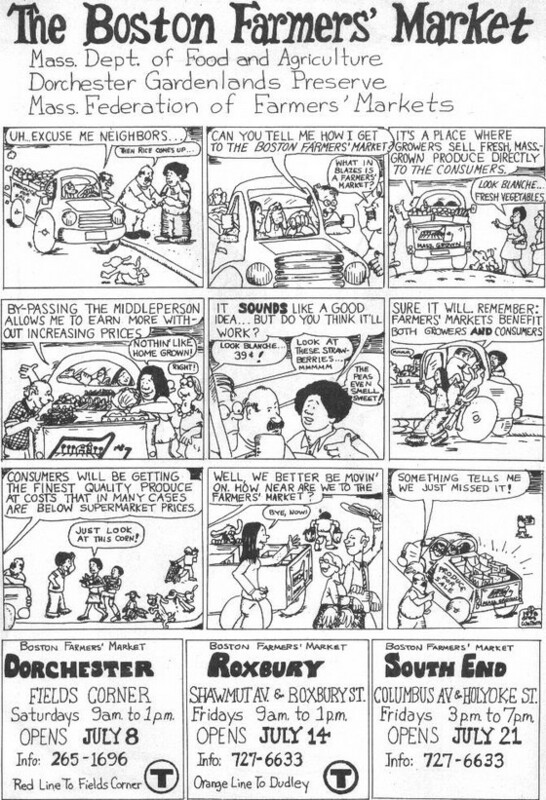 The farmers' market planned for Roxbury never really got off the ground. 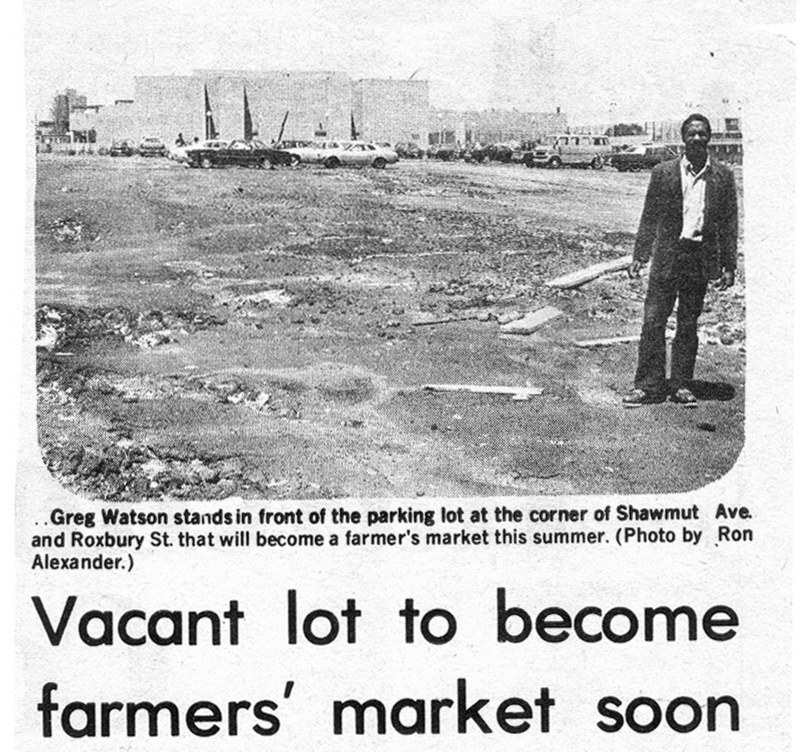 While there were several reasons for this, the bottom line is we picked a poor site -- a vast and uninviting vacant lot located blocks away from walking traffic. 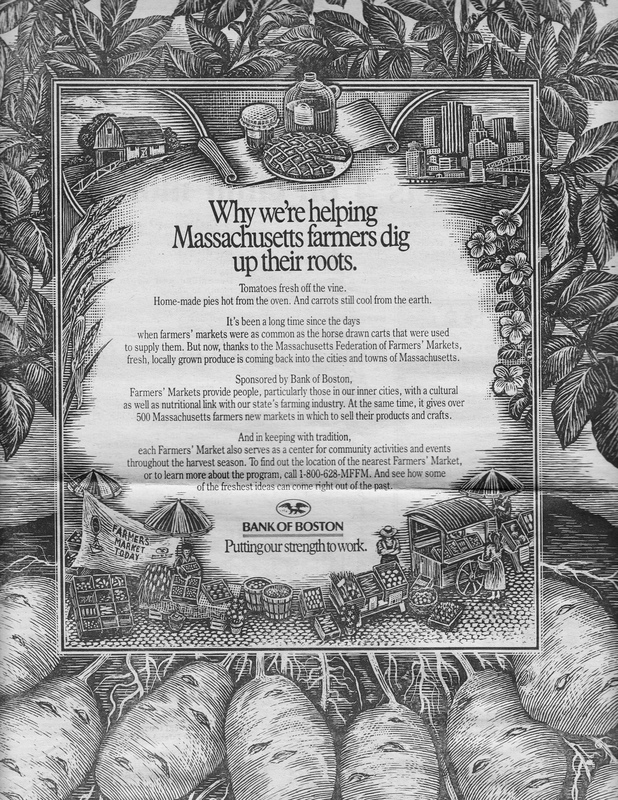 We had a very difficult time recruiting growers (many who stated flatly that they were afraid to come to Roxbury). We finally got one farmer willing to sell at the site on opening day (the week after the Dorchester opening). 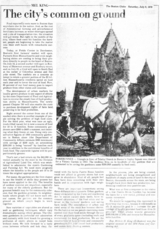 John Bauer drove all the way from Whately in the western part of the state. Trouble is, there were no customers. I felt so bad that I took our two signs market signs, turned them into "sandwich boards" and walked down a few blocks trying to get people to visit the site but was not very successful. 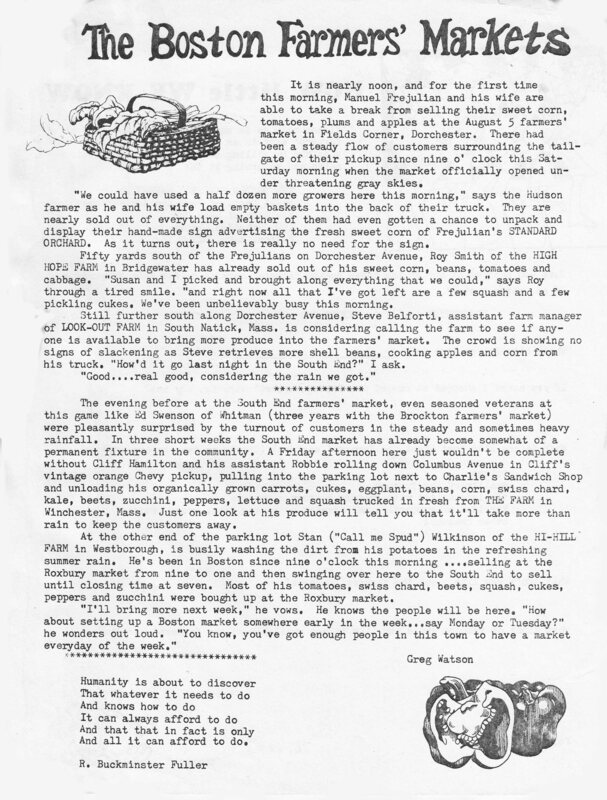 The following week, word-of-mouth from the small handful of folks who did shop at the market must have struck a chord. 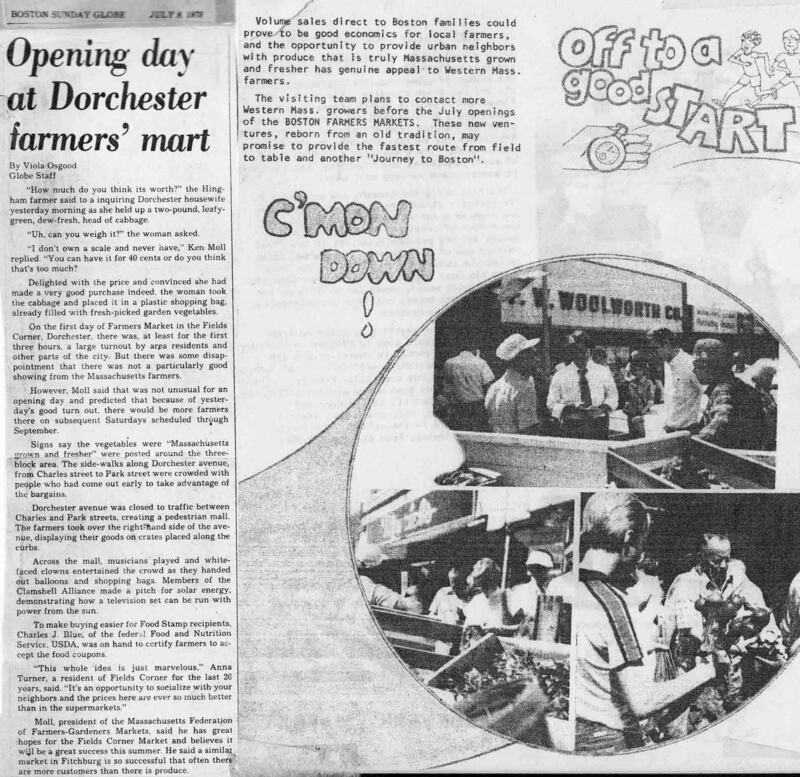 A throng of residents looking for fresh produce showed up at the market's scheduled opening time, but Mr. Bauer had been so understandably discouraged by the previous week's poor turnout that he did not return. So this time we had lots of customers but no farmers. We endured one more similar cycle and the market before it we had to admit that this market was doomed. 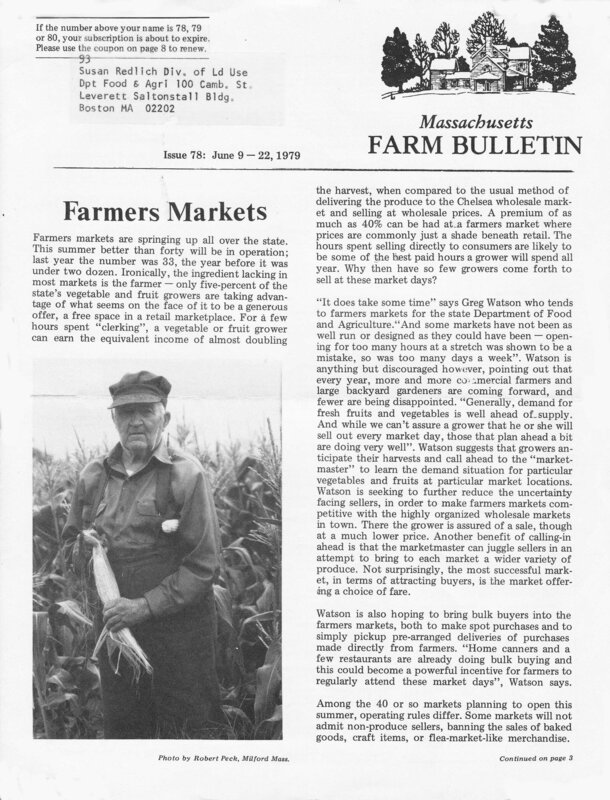 Whitman, MA grower Ed Swenson loved the South End Farmers' Market. 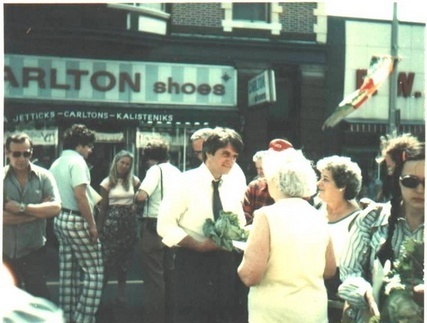 He would often arrive an hour before the market opened and have lunch at Charlie's Sandwich Shoppe, whose owner's made their parking lot available to host the market each week. During the summer, Ed would bring his daughter Sondra with him to help at his stand. 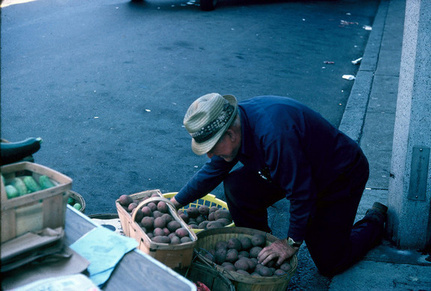 In the fall, when she had to return to school, Ed recruited South End residents to help him and paid them with produce - which they greatly appreciated! 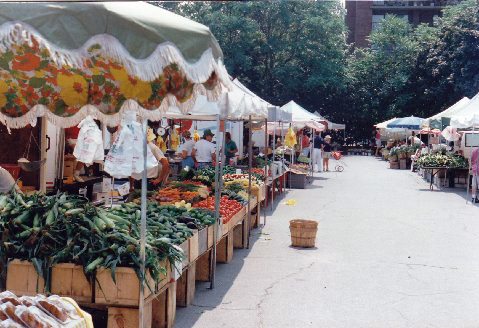 We found farmers' Markets to be a continuous source of win-win opportunities. 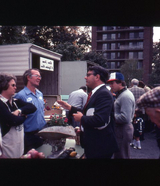 Commissioner Fred Winthrop stops to chat with seller Gus Schumacher -- who would serve as commissioner from 1985 to 1990.